For some reason, a bit out of season, I've encountered so many good looking cherries at the store! It made me nostalgia for the northwest, where we were on vacation just a month ago. I grew up with two trees of cherries at my childhood home - the golden cherries with pink blush (known as "Rainier" cherries in many places) and the darker red cherries that most people think of. The birds loved them; what we picked we just ate and didn't really bake with, so I didn't have a lot in my repertoire for cherries. I have a few recipes marked to try, but this one stood out. 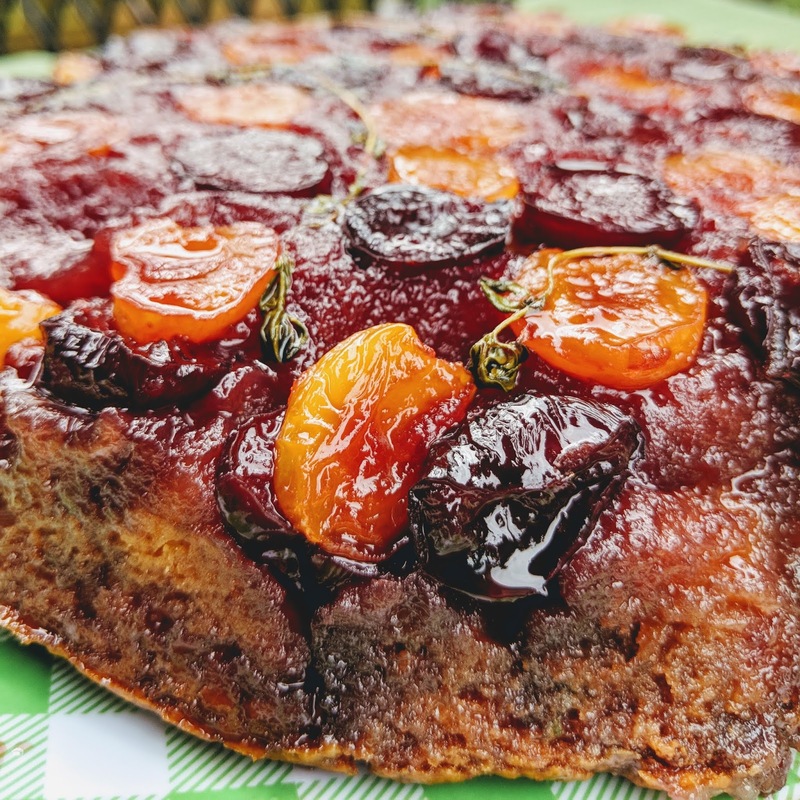 I recalled an episode of some baking reality show where all the bakers had to make an upside down cake of any variety, as long as it contained fruit. I liked the sound of cherries and thyme, and thought it would be gorgeous with the variety of colors of cherries. Preheat oven to 350°F. Prepare the Topping: Place butter in a 9-inch round baking pan, and place in preheated oven until butter is melted, 2 to 3 minutes. Tilt pan to coat sides with butter. Stir brown sugar into melted butter in bottom of pan until smooth, spreading it evenly on bottom of pan. 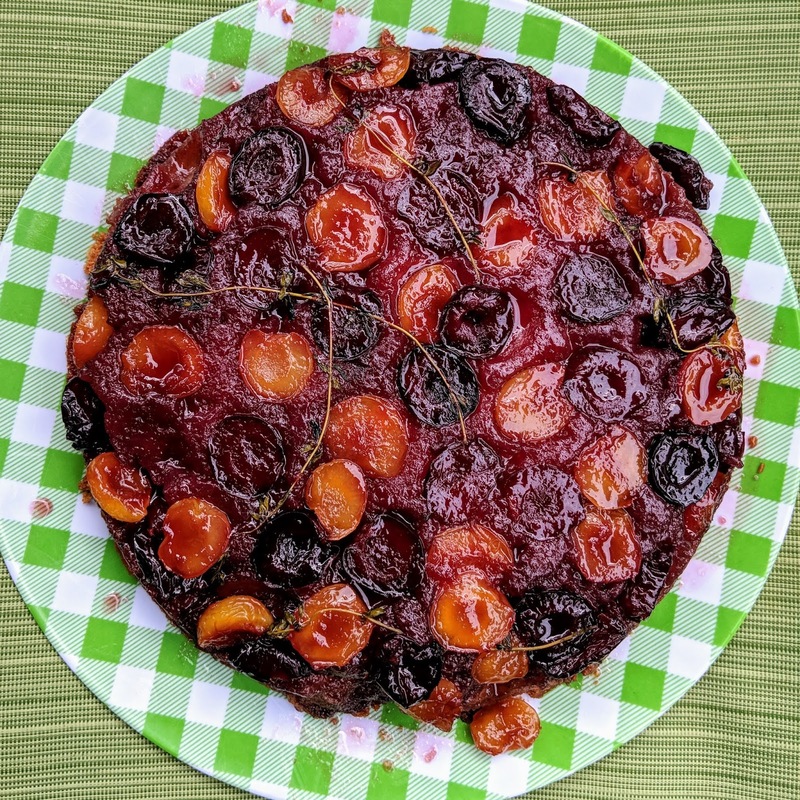 Decoratively arrange cherries, cut-side down, and thyme sprigs on brown sugar mixture. Prepare the Cake: Whisk together flour, thyme leaves, baking powder, baking soda, and salt in a medium bowl. Set aside. Beat together brown sugar and butter in bowl of electric stand mixer fitted with a paddle attachment on medium speed until light and fluffy, about 3 minutes, scraping down sides of bowl as needed. Add egg and vanilla, beating until fully incorporated, about 1 minute. Add flour mixture and sour cream; beat on low until just moistened. Stir ingredients by hand until fully incorporated. Dollop cake mixture over fruit, and spread evenly to sides of pan. Bake in preheated oven until a skewer inserted in center comes out clean, about 40 minutes. Let cool in pan 10 minutes; invert onto a large cake plate. Let cool 5 minutes before slicing. Sprinkle with more thyme leaves, and serve with whipped cream or ice cream. I paid attention to the instructions and barely mixed the batter, so the crumb was very tender. 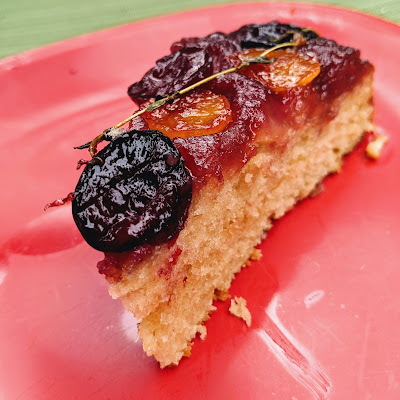 The cherries end up the texture of grapes, maybe, or peaches, not so much the cherries in the end, but the flavor is intense.